Car jump starters are not created equal. They come with different features, dimensions, and even different battery technologies. So, how do you know which jump starter is right for you? Price alone should never be the only guiding principle. A low-cost jump starter might sound like an attractive option but will it start your car in sub-zero temperatures? Similarly, a high-end version might have all the bells and whistles, but do you really need them all? If you are looking for one that gets the job done well without costing you a fortune, GOOLOO 450A Peak Car Jump Starter is the one for you. 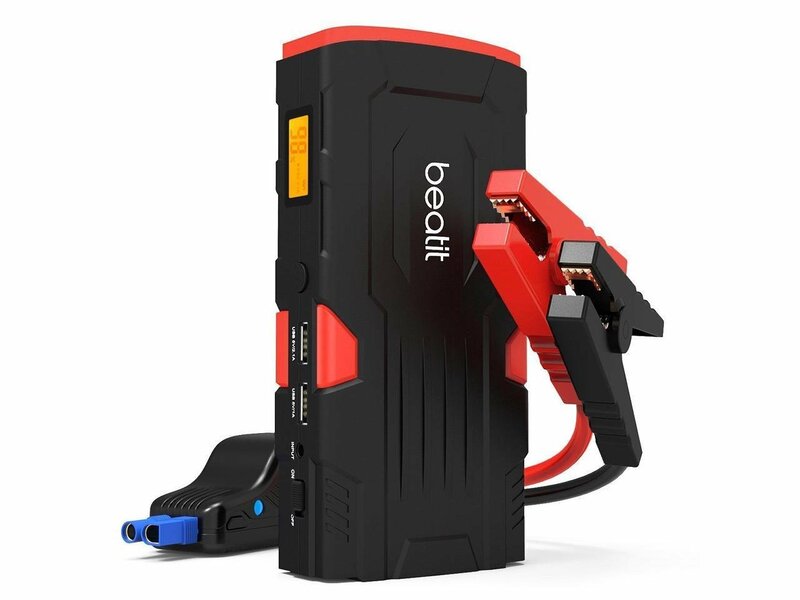 We have listed a few critically important things that you need to consider before investing in a device that may, or may not work in all situations such as a jump starter. Although all modern cars are fitted with 12V batteries, you may have an older, classic car that still has a 6V battery. It will suffer damage if you start it with a 12V jump starter. The same goes for garden tractors and some marine batteries, so make sure the jump starter you buy has the ability to work on 6V batteries. If you live in an area with harsh winter conditions, you need a jump starter that matches the cold cranking amps of a fully charged car battery. If you need, say, 200 cold cranking amps, there is little point in using a jump starter that only delivers 150 cold cranking amps, both the battery and the jump starter can be damaged. In most cases, a jump starter that delivers about 900 peak amps or too cold cranking amps will be able to start a car in sub-zero temperatures, if the car’s battery is completely discharged. However, make sure that the jump starter you buy is rated to deliver the stated currents in sub-zero temperatures, since some brands do not work in very low temperatures. Different battery technologies require different recharging times. For instance, lithium-ion batteries may take longer to recharge than the lead acid batteries in some jump starters. A fully charged lithium-ion jump starter can jump start a car for up to 20 times before it needs to be recharged, whereas lead acid batteries may only deliver one or two jump starts before they need to be recharged. Thus, choose the jump starter that can deliver the most jump starts with the shortest possible recharge time. Cheap jump starters often have clamps that are not strong enough to ensure proper contact with the battery terminals. Poor contact with the battery can damage both the battery and the jump starter. So, make sure you choose a jumps starter with clamps that are strong enough to cut through the gunk that may have built up on the terminals. Also choose a device with properly insulated clamps to prevent electric shock, or accidental short circuits against engine components when you make connections. Click here to get the best-selling jump starter with high-quality clamps. The basic rule is that the longer the cables, the easier it is to use a jump starter. Avoid jump starters with cables that are shorter than about 48 inches, because you need to connect the negative cable to the grounded part of the vehicle that is as far away from the negative terminal as you can get. Connecting to the negative terminal can result in arcing if the contact is poor, which in turn can ignite hydrogen gas if it is present in sufficiently high concentrations. Hydrogen gas is a by-product of normal battery operation. So, choose a jump starter with cables that are long enough to enable you to make connections safely. Some jump starters that incorporate compressors, lights, and other accessories can weigh as much as 20 pounds. And while having a compressor can be an advantage, its added weight can make some jump starters impractical, unless you go camping all the time and use the compressor to inflate air mattresses or so. As a rule, the fewer accessories a jump starter has, the lighter it is, so choose the jump starter that gives you all the features you need without adding to its weight unnecessarily. There are as many warranties as there are jump starters, and there is no standard, one-size-fits-all warranty that covers all eventualities. Some warranties are valid for only 90 days, while others run for two years and even longer. Make sure you get a warranty that covers the conditions in which you will be using the device. For instance, some jump starters are not covered for use in sub-zero temperatures, and all have varying conditions that cover them (or sometimes not) against storage temperatures. So, if you are considering a compact unit that can fit in your glove compartment, make sure its warranty covers it against the varying temperatures that can develop inside cars. Many jump starters incorporate features like radios, lights, compressors, 12V and AC power outlets, USB ports for charging or operating cell phones, tablets, or even computers. While some of these features can be very helpful during power outages, all of them add to the size, weight, and price of the basic jump starter. However, having all the bells and whistles can be very important during natural disasters when there is no electricity supply, so keep this in mind when you are about to make a purchase of a jump starter. There is no single best car jump starter- all have advantages and disadvantages, and it would be impossible to choose even the best 50 jump starters out of the several hundred models available today. However, keeping the above considerations in mind, you can make the right choice.